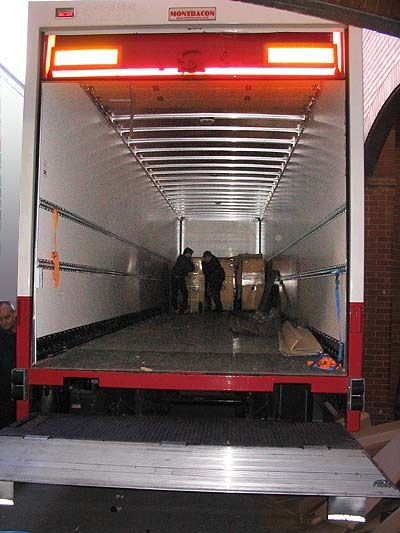 ...add a bunch of other vans and trucks, fill them with pinballs from around the country and take them to Aston Villa Football Club? 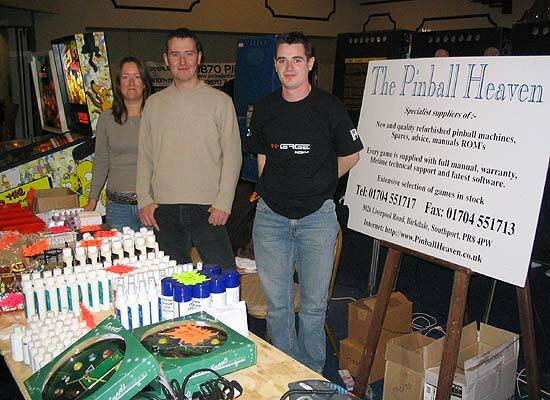 The answer is the UK Pinball Show 2005. 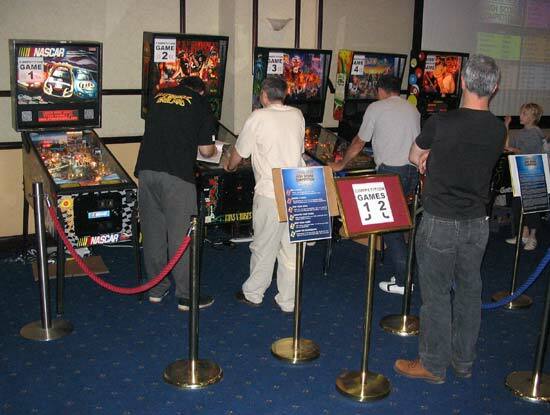 This is a new show brought to us by Pinballers Anonymous and Pinball Heaven with sponsorship from Nokia N-Gage and their new Mile High Pinball game and all proceeds going to Nokia's chosen charity of Mencap. Being new, nobody knew how much enthusiasm there would be from the collector community who would be donating the vast majority of games and whether vendors would come and sell parts and games. Also, would anyone turn up? Here was the venue at 8am, three hours before the show began. 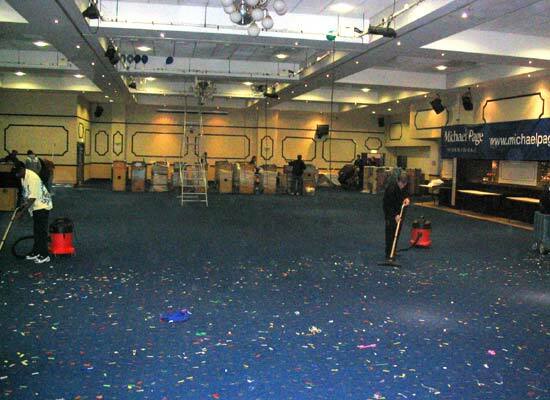 They were clearing up from the party the previous night when the first pins rolled off the trailers and started to be set up. 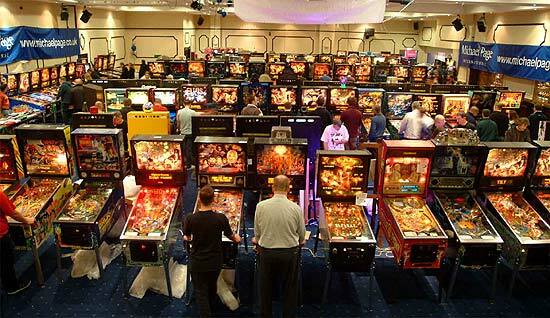 Amazingly, over 140 pinball games had been brought together for visitors to play for their £5 entrance fee. Here's a complete list made on Sunday morning. Pinball Magic, Revenge From Mars, Star Wars Episode 1, Attack From Mars, Funhouse, Whitewater, Fish Tales, Secret Service, Dr Who, The Addams Family, The Getaway, Elvira & The Party Monsters, Judge Dredd, Corvette, Scared Stiff, No Fear, Lethal Weapon 3, Whirlwind, Scared Stiff, Fish Tales, Twilight Zone, No Good Gofers, Black Rose, Space Station, Last Action Hero, Indiana Jones, Medusa, Earthshaker, The Shadow, Roadshow, Black Knight 2000, Medusa, Medieval Madness, Starship Troopers, Space Invaders, Sorcerer, Vector, Monster Bash, Champion Pub, Star Trek - TNG, Champion Pub, The Shadow, Fish Tales, Night Moves, Lord Of The Rings, Revenge From Mars, Twilight Zone, Elvira & The Party Monsters, Roadshow, Creature From The Black Lagoon, Demolition Man, Batman, No Good Gofers, The Addams Family, No Fear, Roadshow, South Park, Junkyard, Indianapolis 500, Cirqus Voltaire, No Good Gofers, The Addams Family, The Shadow, Medieval Madness, Corvette, Jackbot, Phantom Of The Opera, Dr Dude, Six Million Dollar Man, Supersonic, Party Zone, Back To The Future, Scared Stiff, Star Trek - TNG, Dr Who, Eight Ball Champ, Title Fight, The Addams Family, Scared Stiff, Twilight Zone, Star Wars, Gulfstream, The Simpsons Pinball Party, Lord Of The Rings, Creature From The Black Lagoon, The Shadow, The Getaway, Tommy, Whirlwind, Judge Dredd, Delta Queen, Revenge From Mars, Star Wars Episode 1, Elvis, Demolition Man, Star Wars, Twilight Zone, The Shadow, Scared Stiff, Earthshaker, Fathom, Centaur, Lexx, Theatre Of Magic, Twilight Zone, Dr Who, Flintstones, Johnny Mnemonic, Jurassic Park, Creature From The Black Lagoon, Terminator 2, Pool Sharks, Creature From The Black Lagoon, Freddy - A nightmare on Elm Street, Batman, Elvis, Funhouse, Cirqus Voltaire, Medieval Madness, Indiana Jones, Star Trek - TNG, Twilight Zone, Guns N Roses, Star Wars Episode 1, Street Fighter 2, Twilight Zone, Bram Stoker's Dracula, Indiana Jones, The Shadow, Twilight Zone, Johnny Mnemonic, Judge Dredd, Guns N Roses, Indiana Jones, Star Trek - TNG, Maverick, Fish Tales, Twilight Zone, Nascar, Guns N Roses, Monster Bash, Cactus Canyon and Cue Ball Wizard. 143 games in total. There were too many games for the main hall alone both in terms of space and power requirements, so they spread out into surrounding hallways and the entrance hall too but there was still a hugely generous space between rows allowing families to stroll freely down the aisles without disturbing players. 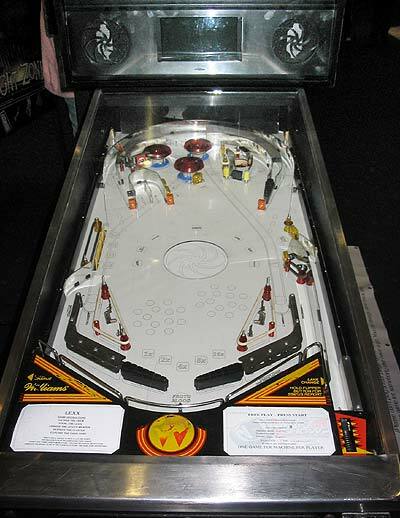 And because the games were largely from private collectors, the condition was generally of a high standard and the owners were around to answer questions and perform quick repairs when needed. It was possible to get so many games because Nick from Pinballers Anonymous had driven around the country in the days before the show collecting games from people's homes. This solved the problem of individuals not being able to transport machines, thus eliminating one of the biggest reasons cited for not donating games. Although the show was busy, it was never overwhelming and it was always possible to find a game to play. Machine hogging wasn't much in evidence and players were all well behaved. 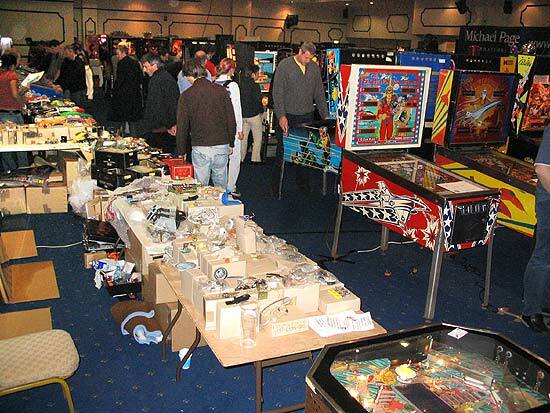 Many games at the show were also for sale with many deals being done over the two days. Besides the games themselves there were also plenty of pinball parts for sale too. Not just the common stuff but some genuinely hard-to-find parts and quite a lot of electro-mechanical items too. Organisers Pinball Heaven and Pinballers Anonymous were there of course. But so were many other vendors. 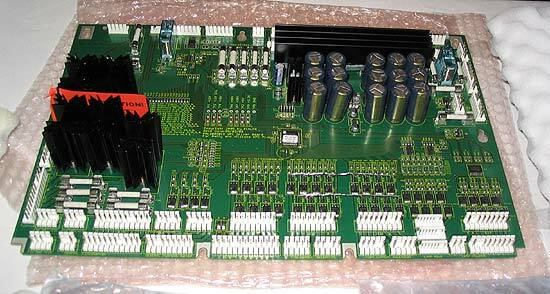 Sean at Pinball Palace had the very first PinLED replacement WPC/WPC-S power driver boards on sale. Most of the sellers had special offers for the show and generally the prices seemed below average for this type of event producing some real bargains in places. Pinball News was also involved in the running of the show. We knew the event had to have a competition of some kind, so with the organisers busy getting the show off the ground there was only one thing to do; organise it ourselves. Thus, the Pinball News High Score Competition was born. Bearing in mind the expected mixed audience for the show, we wanted to create something less immediately competitive than a straightforward tournament and to make it easier to understand. So there were four different machines - Monster Bash, Cactus Canyon, Guns N Roses and Nascar - chosen for their variety and attractiveness. 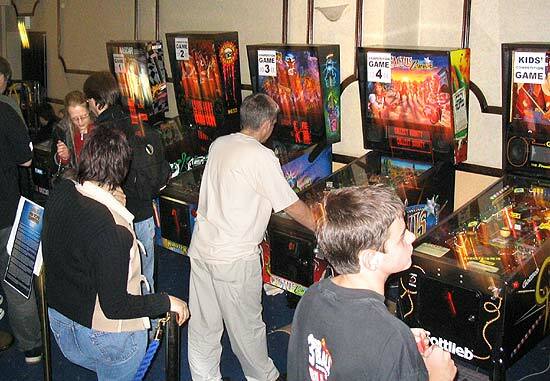 An individual high score competition was run on each game simultaneously during the day, closing an hour before the show ended. Then, the highest scorer from each machine met in a four-player final to decide the day's winner. There were separate competitions each day and there was a straightforward high score competition on Cue Ball Wizard for the kids. Visitors were encouraged to take part in the competition by receiving a free entry with their admission and additional entries could be bought for just £1. All proceeds from competition ticket sales also went to Mencap which came to £175. The current scores to beat on each machine along with the most recent scores were displayed on a projection screen driven from a PC so players always knew how well they were doing. In total, 335 competition games were played. The final for Saturday's competition was played out on Nascar between Terry Sulivan, David Dutton, Ian Toplis and Adrian Donati. David appeared to have secured first place with his 28,510,880 until Adrian played the very last ball when his bonus score took him to 35,988,430 and the trophy. He also won a Nokia N-GAGE system with games. On Sunday we ran the same competition format but as everyone expected the final to be on Nascar, that was the most popular game of the day. Consequently, we decided to play out the final on a brand new Simpsons Pinball Party. Ivan Durneen, William Dutton, David Dutton and Robert Murray were the finalists. Father and son David and William Dutton battled it out for the top slot with dad David narrowly winning by 39.2 million to 38.8 million. He won the trophy and the N-GAGE system and games but William won his own N-GAGE systems by topping the kids' competition on both days. Runner-up prizes were provided by Nokia, Pinball Heaven and Marco Specialties. 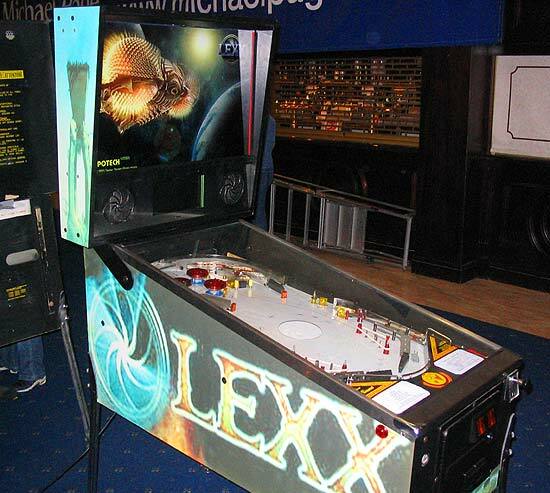 Nokia also provided a top-of-the-range phone for the best hobbyist game at the show which went to this Lexx development machine created by Phil Dixon. Running on a Linux-based system it features a full colour display and multi-channel audio system. We will bring you more details on this game as it nears completion. The show officially drew to a close at 4pm on Sunday. In actual fact the final of the competition continued past that point, so prizes were eventually awarded at 4:30pm and the task of packing up began. 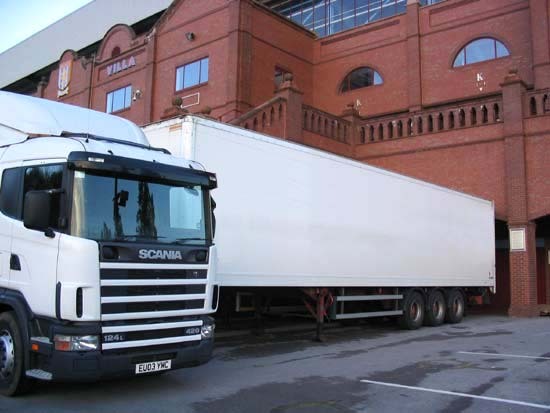 By 7:30pm all the games had been packed away, either into owners' cars and vans or into the trailers and delivery back home over the coming days. The show must have exceeded everyone's expectations both for the number of games and the overall quality of the event. Can it become an annual occurrence? There were many extraordinary offers of help for this show - from the trailers to the games, the sponsorship and the prizes - which may not be available annually, so the calculations must be done to see if it's viable to hold again. 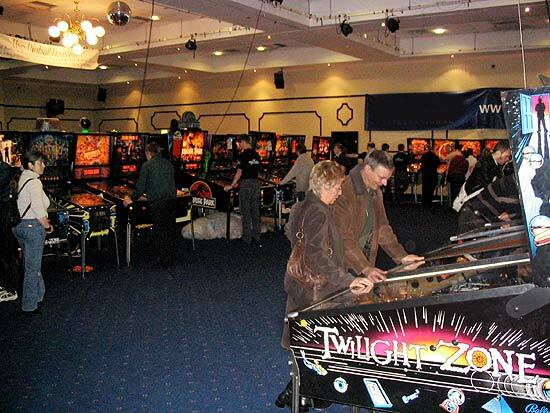 Hopefully it will be, because Sean at Pinball Palace told Pinball News he will not be holding any more Pinball Extravaganza shows in Margate, so this will be the big event for the UK. 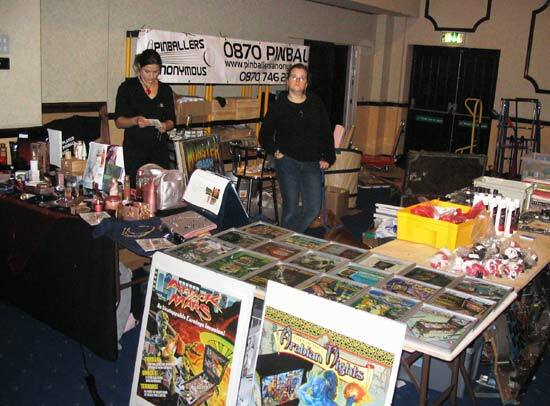 Here's hoping the sums all add up and we can be back again for a UK Pinball Show in 2006. Thanks to Keith Hartwell for additional photography.